This book makes clear that Arendt is amazingly well read... Though, given 50 years, I am always amazed at how much more we are supposed to read (and often how much less we do) as modern academics and students rather than academics in the 1950s and 60s. While I can see the relevance of Arendt's writing on this subject in reference to the time the book was published and in response to authors like Sorel and Fannon, unlike many of the other reviewers I am not a fan of this book. Her, at times polemical, arguments do not clarify anything for me and don't promote learning through questioning, they replace erroneous concepts with more erroneous concepts. Her book, rather than clarifying the way terms and concepts could be used or leading us to interesting ideas, is full of frustratingly confounded and under-developed concepts.The basic premise of the book is that a "lack of power begets violence." While this is an interesting beginning, it relies on mistaken understandings of power and violence and simply reveals how writers like Lukes and Foucault were sorely needed to revolutionize the concept of Power; how thoughts of resistance had yet to filter through from Brechtian theater to James Scott's peasants and academic debate; and how writers like Kalyvas and Galtung are crucial for the current clarification and study of violence. Power is lamely described as the “human ability not just to act [individually:] but to act in concert with.” (44) This is what Lukes would call a one dimensional power concept. It does not confront how power reflects who wins the game, who makes the rules of the game, and how the rules are internalized. Indeed, it barely hints at the coming understanding of power as entitlements (the power to the good life, Sen). She boils this further down through confused definitions of strength, force, and authority until she reaches the conclusion that Power is fundamentally 'political consensus and legitimacy.' Violence is never clearly defined. Though, it becomes obvious that she is referring to corporeal violence, with broad application of violence within other modes of political action. With these concepts she cannot confront structural or cultural violence, or even oppression and resistance.Working off the premise that power is control (guaranteed through political consensus) she points to physical violence as a symptom of lost power or changes in power (that is lost consensus or changes in consensus). Because Power is conceptualized only as 'civitas' and consensus (really she fails to clearly present this argument), she misses the role of physical violence as a way to ENFORCE power, the strategic application of violence to maintain or gain power (Kalyvas, see Eastern Congo), and falls back on a sort of Hobbesian view of the world... without order there is chaos and violence. Rather than see violence as a lack of power, we should see the role of violence as a strategy to maintain and gain power, as fundamental to power, as common in transitions between power, and in the loss of consensus. Then we can find ways to minimize physical violence by doings such things as promoting social justice in the face of institutional violence and prejudices, facilitating peaceful political and economic changes, and engendering consensus. Where there is a lack of incentives to use physical violence and a capacity to reach real social and political consensus through nonviolent means, I would imagine that direct physical violence would be less prevalent. I imagine this is what Arendt wants to say, but she ultimately misdefines "power" and under theorizes "violence". كتاب عظيم لأقصى حدّ بالنسبة لي.. والخمس نجمات هنّ لقيمته المعرفية بالنسبة لي وللمفاهيم التي اكتسبتها منه.. الريفيو قريباً إن شاء الله.. I can feel myself slowly falling in love with Arendt. I already respected her, having been in the process of reading her "Origins" book for some time now. But in these shorter works of hers, you can really see her reasoning power and witness how perfectly balanced her turns of phrase are. What I most like about "On Violence" is that I can detect the research that has gone into writing this small essay. Her sentences are very compact, so in the end even a few of them can relay a lot of information. I would recommend this to anyone with an interest in the distinction between violence and power and how the two act if used in any political discourse. Had this been written by Joan Bloggs, it would be out of print and almost certainly ignored. But it was written by Hannah Arendt, so it's in print. And given the lack of books on violence, that's probably a good thing. Unfortunately I suspect that it can easily be misread. The historical context here is everything: Arendt isn't writing about violence, she's writing about violence at the end of the 'sixties and start of the 'seventies, when for a brief moment fairly large numbers of people thought it was okay to blow up unjust things. Arendt makes her standard republican (not the party, which is increasingly less, you know, republican) argument that communal action can interrupt unjust structures, whereas violence can do so only very rarely, and for very short periods of time. And she's also arguing against sociobiology's first golden age (if that's really the right term for it); people like Lorenz tried to find biological or psychological grounds for aggression, which has the obvious effect of naturalizing it and making it impossible to argue against. Not to mention being extremely silly, but that doesn't stop anyone in today's golden (again, wrong term) age of evo-psycho-sociobiology. She argues by distinguishing between 'power,' which is what we have when we act communally; 'strength,' which is what an individual can do on her own; 'force,' which "should be reserved" for natural or structural force rather than intentional force; 'authority,' which is the possession of unquestioned leaders; and finally 'violence,' which is only ever an instrument to the ends of power or authority. This is all tendentious, but she puts it to good use.Arendt argues on the basis of these definitions that revolution begins with a loss of authority, not with violent deeds; and that violence is not necessarily irrational. Fair enough. But that seventies moment is far in the past. There aren't many people left who favor revolutionary violence (for better and worse); evo-psycho-sociobiologists spend their time naturalizing addictions rather than aggression; and making republican (not the party) arguments in public is met everywhere with scorn (on the right because you don't want the government's hand in your wallet; on the left because you don't want the government's hand on your privates). What's left are a couple of interesting obiter dicta:i) That the U.S.A. started out as an anti-sovereigntist entity, but then took over the idea of sovereignty from Old Europe. ii) More bureaucracy will lead to more violence, because when there's nobody to blame with words, people lash out with limbs and weapons. Although structured as a three-part essay, this is essentially two intertwined essays in one. Each is interesting in a different way. The ideas of one, focused on the engagé moment, come out of the student revolutions in Europe and the U.S. (and, to a lesser extent, black power). This essay takes the reader back (if old enough) to an interesting moment that turned out not to have had a great effect, politically, on the future (its greatest effect, especially in the U.S., has been the reaction to it). Think student revolution now, and you think of Iran. It was also the time when nuclear deterrence put violence in a different light than today, when violence is thought of mainly in terms of terrorism, civil wars, and drones.The other essay, more universal, is largely definitional. Arendt did a great job separating the concepts of power, authority, and violence.“[T]he power structure itself precedes and outlasts all aims, so that power, far from being the means to an end, is actually the very condition enabling a group of people to think and act in terms of the means-end category.”“Legitimacy, when challenged, bases itself on an appeal to the past, while justification relates to an end that lies in the future. Violence can be justifiable, but it never will be legitimate. Its justification loses in plausibility the farther its intended end recedes into the future.”Hence, “Violence can destroy power ... What never can grow out of it is power.”“To remain in authority requires respect for the person or the office. The greatest enemy of authority, therefore, is contempt, and the surest way to undermine it is laughter.” Yes and, unfortunately, no. كتاب موجز، أشبه برسالة، في تحليل ظاهرة العنف، لا عنف الدولة بالذات، وإنما لماذا نستخدم العنف، كمجتمعات أو كدولة، فيه استكمال للنقاش حول العنف النقي والسيادة بين فالتر بنيامين وكارل شميت، والذي تفرّع كثيراً بعدهم، ولكنه منشغل أكثر بتحليل العنف مجتمعيّاً وعمليّاً كما ظهر في مظاهرات السود في أمريكا، أو مظاهرات الطلاب في فرنسا، وعنف الدولة في حين تتراجع سلطتها.وهذه الأخيرة لعلها إحدى أهم أفكار الكتاب، حيث لا ترى حنه أن العنف دليل على السلطة، بل إن العنف يظهر كلما تراجعت السلطة. A fantastic treatise on the nature and function of violence, particularly in the modern period. However, the focus is overwhelmingly from the political dimension. Divided into three parts, parts 2 and 3 are essential reading. Part 1 oftentimes comes off as dated in its examples and outlook. But it is Part 2 that makes the entire book. In it, Arendt carefully delineates and differentiates definitions for "Power", "Strength", "Force", "Authority", and "Violence". All of which are useful if not necessary in thinking about the state of affairs today. I also found memorable her description of bureaucracy, that form of government based on intentional distance and anonymity. She labels it the "rule by Nobody", a succinct but capturing descriptor.The book is highly recommended for the "concerned" and "active" out there as it pushes us to think more carefully about the various causes and systems we either stand behind or are caught in. This was a really great work of political theory by Arendt. It explores violence, mostly through the lens of the 1960s when she was writing this book. It looks at the student rebellions across the world, in both democracies and communist countries. The coincidence of the uprisings is interesting, and she posits that they are both protesting for the same reason, albeit in different manifestations. Students around the world were looking for freedom. The students in communist countries were looking for freedom to express themselves through both speech and action and thereby have an effect on the processes and progress of their respective countries. The students in the Western democracies were protesting their lack of freedom in action. They protested the lack of agency they felt. Both sets of students felt impotent and unimportant, as if they entirely didn't count, and decided to protest against it. Some of the most impacting quotes for me:"Rage is by no means an automatic reaction to misery and suffering as such; no one reacts with rage to an incurable disease or to an earthquake or, for that matter, to social conditions that seem to be unchangeable. Only where there is reason to suspect that conditions could be changed and are not does rage arise. Only when our sense of justice is offended do we react with rage, and this reaction by no means necessarily reflects personal injury, as is demonstrated by the whole history of injury, as is demonstrated by the whole history of revolution, where invariably members of the upper classes touched off and then led the rebellions of the oppressed and downtrodden. ""Power and violence are opposites; where the one rules absolutely, the other is absent. Violence appears where power is in jeopardy, but left to its own course it ends in power's disappearance... Violence can destroy power; it is utterly incapable of creating it. ""Where all are guilty, no one is; confessions of collective guilt are the best possible safeguard against the discovery of culprits, and the very magnitude of the crime is the best excuse for doing nothing. ""Racism, white or black, is fraught with violence by definition because it objects to natural organic facts - a white or black skin - which no persuasion or power could change; all one can do, when the chips are down, is to exterminate their bearers. Racism, as distinguished from race, is not a fact of life, but an ideology, and the deeds it leads to are not reflex actions, but deliberate acts based on pseudo-scientific theories. Violence in interracial struggle is always murderous, but it is not "irrational"; it is the logical and rational consequence of racism, by which I do not mean some rather vague prejudices on either side, but an explicit ideological system. ""The technical development of the implements of violence has now reached the point where no political goal could conceivably correspond to their destructive potential or justify their actual use in armed conflict. "I'm thinking about more right now, but I haven't found the best way to express it yet. I want to write about the way the book made me think differently about how Americans were celebrating the death of Osama bin Laden, and what this says about us and the war on terror. So I'll probably be editing this in the future to add some about this, using a few of the quotes above, and maybe some others. 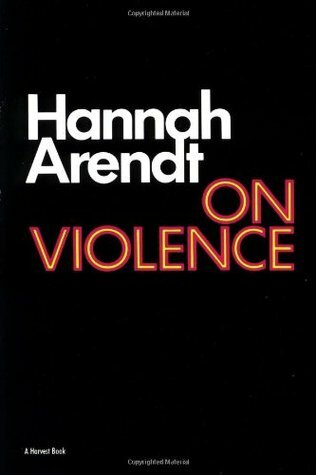 In order to appreciate this book, you have to understand Hannah Arendt here is thinking of violence in political terms: war, uprising, rebellion, etc. That said, some of her points are applicable on the complete spectrum of human violence. The fact that it is a mean and not an end for example. That is served as a theater for the cause it is serving and that is what makes it terrifying when properly used. Arendt also wisely draws a line between purposeful violence and emotional violence, which helps her definition of the term as instrumental. The book is, of course a little dated because it addresses mostly issues of the cold war, which are not pertinent anymore, but I've learned a thing or two and appreciated Arendt's straight, no bs prose. Nice change from french post-structuralists! Hannah Arendt does an excellent job of tracing the thread of violence through the quilt of violent acts. أثمة حقاً عنفٌ نبيل ؟..كذاك الذي يُحيل القط أسد في لحظةٍ كي يحمي الصغار؟...أم أني فقط أبحث عن ذريعةٍ لكي أشرب نخب رؤوس الظالمين في وضح النهار ، فلا يعاتبني الضمير ؟...(لا تبرير للعنف)، هكذا يقول العاقلون ...لكني رغماً عني أحببت (حنّة) أكثر ، كلما رأيتها تُرافع عنه و تدافع وكأنما قد وجدت له ما يكفيها من اﻷعذار ...وكأنها تقول إن كان حِنق اليائسين راكدٌ كالماء آسن ..فالعنف إذن ليس إلا غضب المفعمين باﻷمل..ليس إلا خوفٌ آخر قد تحلى بالجسارة. ..وباعتقادي لا تكمن المأسآة هنا في فعل اﻹيذاء ذاته ، بقدرما هي في براعتنا البشرية اللامتناهية لمنحه العديد من اﻷسماء ...كأن نسمي القط قاتل ،وننسى أننا كنا منذ البدء من قذف الصغار بالحجارة ." إن المواثيق في غياب السيف، ليست أكثر من كلمات." هكذا تستعير (حنّة أرندت) عبارة الفيلسوف (هوبز) هذه، لتؤكد على حقيقة أن " العنف هو التجليّ الأكثر بروزاً للسلطة " على حد تعبيرها، أو كما يقول الكاتب (رايت ميلز) : " كل سياسةٍ إنما هي صراعٌ من أجل السلطة ، والعنف إنما هو أقصى درجات السلطة" ، غير أن هذا العنف المنظم على هيئة مؤسسات تحكمها بالضرورة حفنة من القوانين المتوافق عليها سلفاً ، إنما يستمد سُلطته تلك من الشرعية التي يمنحها إياه محكوميه لغرض حمايتهم ، ومتى فقد تلك الشرعية صار محض حُكمٍ بالإرهاب، مُؤذناً بمبارزةٍ حتمية مع صورٍ أكثر فوضوية للعُنف المقاوم ..تقول (حنّة أرندت): " ويتعين علينا أن نتذكر هنا أن العنف لا يعتمد على العدد أو على الرأي العام "حيث بإمكان رامٍ واحد يحمل رشاشاً أن يُخضع مئات من الناس المنظمين" ، بل على الأدوات، وأدوات العنف قبل كافة الأدوات من شأنها أن تزيد وتُضاعف القدرة البشرية. وأولئك الذين يُجابهون العُنف بالسلطة وحدها، سرعان ما يجدون أنفسهم على تجابهٍ ليس مع البشر ، وإنما مع الآلات التي يصنعها البشر، الألآت التي تتزايد لا إنسانيتها وفعاليتها التدميرية ، بالتناسب مع المسافة التي تفصل بين المتجابهين. إن بإمكان العنف أن يُدمّر السلطة دائماً، فمن فوهة البندقية تنبع أكثر القيادات فاعلية، مُسّفرة عن أكثر أشكال الطاعة كمالاً. أما ما لا يمكنه أن ينبع من فوهة البندقية ، فهو (شرعية) السلطة." " إن إحلال العنف محل السلطة قد يُحقق النصر، لكن الثمن يكون مرتفعاً جداً ، لأن من يدفعه لا يكون المهزوم وحده ، بل يدفعه كذلك المنتصر، وعلى حساب سُلطته الخاصة. " تدرك (حنّة أرندت) إذن تلك البداهة حتماً ،إلا أن ذلك لم يمنعها من النظر إلى" العنف" بشكل أكثر حيادية، منتقدة وبعنف تلك الدراسات النفسية التي جعلت منه نشاطاً غرائزيا لا ترقى له الإنسانية ...تقول في أقرب أجزاء الكتاب إلى قلبي: " أن يكون العنف أمراً ينتج عن الغضب، مسألة يتفق عليها الجميع، ومن شأن الغضب حقاً أن يكون لا عقلانياً ومَرَضياً ، ولكن أفليس هذا حال كافة العواطف البشرية الأخرى؟ مما لا شك فيه أن بالإمكان خلق الشروط التي تُجرّد الإنسان من إنسانيته ، لكن هذا لا يعني أبدا أن الإنسان سيتحول بالتالي إلى حيوان، وفي مثل هذه الشروط ، من المؤكد أن ما يكون مؤشراً واضحاً على انتزاع الإنسانية عن الإنسان هو غياب الغضب والعنف، لا حضورهما. ليس الغضب بأي حال من الأحوال، هو رد فعل تلقائي إزاء البؤس والألم ، فما من أحدٍ يتصرف تصرف الغضب إزاء داءٍ لا دواء له أو إزاء هزةٍ أرضية أو أوضاعٍ إجتماعية تبدو له غير قابلة لأي تغيير . يطلع الغضب فقط حين تكون هناك احتمالات لحدوث تبدل في الأوضاع. لكن هذا التبدل لا يحدث . فقط حين يُخدّش حسّ العدالة لدينا، نتصرف بغضب، وردّ الفعل هذا ليس من شأنه، بأي حال من الأحوال أن يعكس شعورنا الشخصي بأننا نحن الذين لحق الظلم بنا، وهو ما يُبرهن عليه تاريخ الثورات جميعاً، حين يحدث دائماً أن يتحرك عدد من أبناء الطبقات العليا في رد فعل على سوء الأوضاع والظلم، فيقودون الثورات التي ينتفض فيها المضطهدون والبائسون. "ثم تُضيف في نفس السياق قائلة: " وفي مواجهة أحداث وشروط اجتماعية مُثيرة للغضب، يكون ثمة إغراءٌ كبير بضرورة اللجوء إلى العنف بسبب قدرته التفجيرية وميزته كعملٍ فوري. إن التحرك بسرعة مدروسة يتناقض تماماً مع انتفاضة الغضب والعنف، ولكن هذا لا يجعل منه على الإطلاق عملاً لا عقلانياً . بل على العكس من هذا ، حيث نلاحظ في الحياة الخاصة كما في العامة، أن ثمة أوضاعاً تكون فيها القدرة التفجيرية للعنف، هي الترياق الوحيد الناجع. ليس التنفيس العاطفي هو ما يهم هاهنا، إنه تنفيس كان بالإمكان الحصول عليه بالضرب على الطاولة أو بخبط الباب خبطة عنيفة، المهم هو العنف كفعل مُنجّز من دون استشارة العقل، من دون كلام، ومن دون إعمال الفكر في النتائج، يصبح هو الوسيلة الوحيدة لإعادة التوازن لميزان العدالة (إن بيلي باد الذي قتل الشخص الذي قدّم شهادةً مزورة ضده ، يعتبر مثالاً كلاسيكياً في هذا الصدد) . في هذا المعنى يضحى من الواضح أن الغضب والعنف الذي يتواكب معه أحياناً وليس دائماً، ينتميان معا إلى العواطف الإنسانية الطبيعية، أما شفاء الإنسان منهما فلا يعني أي شئٍ آخر غير نزع الإنسانية عن الإنسان وخصيّه. لا مراء أن مثل هذه الأفعال ، حيث يتولى البشر بأنفسهم تفسير القوانين كما يشاؤون، خدمةً للعدالة، تتناقض مع دساتير الجماعات المتمدنة ، غير أن طابعها اللا سياسي كما يبدو واضحاً في رواية (هرمان ملفيل) الرائعة (موبي ديك)، لا يعني أبدا أنها أفعال لا إنسانية. " ليس هذا فحسب، بل ترى العنف أيضاً كردّ فعل منطقي إزاء تفشي النفاق بالمجتمعات، تقول: " من ناحية أخرى ، إذا ما سبرنا غور التاريخ لنعرف كيف تحول الأُناس الملتزمون إلى أناس غاضبين، سيتبين لنا أن السبب الرئيسي لا يكمن في حدوث الظلم، بل في بروز النفاق. إن نزع قناع النفاق عن وجه العدو ، وكشفه وكشف الألآعيب الضالة وضروب التلاعب من دون أن يلجأ إلى أدوات العنف ، أي الانطلاق في الفعل حتى ولو كان المُنطلق مُعرضاً لخطر الإنسحاق بسبب إعلانه للحقيقة ، هي أمور لا تزال من بين أقوى الدوافع التي تُحرّك اليوم العنف في الجامعات وفي الطرقات العامة. ومرة أخرى من المؤكد أن هذا العنف غير عقلاني ، ولكن بما أن الناس يعيشون في عالم المظاهر، ويرتبط تعاملهم مع هذا العالم بما يبدو منهم لا بما يعتمل في دواخلهم، من المؤكد أن التصرفات المنافقة ، لا يمكن مُجابهتها عبر ما نسميه بالسلوك العقلاني. إن الكلام لا يكون موثوقاً إلا حين تكون ثمة قناعة بأن غايته الكشف لا الإخفاء. إن المظهر الكاذب للتصرف العقلاني، لا المصلحة التي تكمن وراءه هو ما يستثير الغضب. واستخدام العقل حين يكون استخدامه كفخٍ لا أكثر ، هو أمر "لا عقلاني" بأي حال من الأحوال. " وإن كان لي أن أجمع مكتسبات العنف وخسائره في سطور قليلات، لم أكن لأجد ما هو أكثر دلالة من هذا المقطع ..حيث تقول حنة أرندت: " العنف لا يُعزز من شأن القضايا، ولا من شأن التاريخ ولا الثورات، ولا من شأن التقدم أو التأخر: لكن بإمكانه أن يفيد في إضفاء طابع دراميّ على المطالب وإيصالها إلى الرأي العام لافتاً نظره إليها. وكما لاحظ (كونور أوبريان): " أن العنف أحيانا يكون الطريقة الوحيدة التي تُؤمّن سماع صوت الاعتدال". والحقيقة أن العنف وعلى عكس ما يحاول أنبياؤه أن يقولوه لنا ، يمكن اعتباره سلاح إصلاح أكثر مما هو سلاح ثورة. ففرنسا ما كان لها أبدا أن تحوز على القانون الأكثر جذرية منذ نابليون، ليُمكنّها من أن تبدل من نظامها التعليمي العنيف، لو أن الطلاب الفرنسيين لم يقوموا بانتفاضتهم، ولولا مظاهرات فصل الربيع لما كان بوسع أحد في جامعة كولومبيا أن يحلم بحدوث إصلاحات مقبولة، وربما كان صحيحاً أيضا أنه ما كان لأحد أن يُلاحظ في ألمانيا الغربية وجود أقليات مُنشقة لولا أن هذه الأقليات عمدت إلى القيام بأعمال استفزازية، مما لا شك فيه أن العنف يُفيد لكن المشكلة تكمُن في أنه يفيد بشكل لا تمييز فيه، فإن تكتيكات العنف والشغب تكون ذات جدوى بالنسبة إلى أهداف المدى القصير فقط، بينما يبدو العنف غير ذي جدوى بالنسبة إلى أهداف المدى الطويل أو التبديلات البنيوية. أضف إلى هذا أن خطر العنف حتى لو تحرك بشكلٍ واعٍ ضمن إطار غير متطرف، سيكمُن على الدوام في واقع أن الوسيلة تغلب الغاية. فإن لم تتحقق الغايات بشكل سريع لن تكون النتيجة فقط إلحاق الهزيمة بالتحرك كله، بل كذلك بإدخال ممارسة العنف في صُلب الجسم السياسي ككل. إن الفعل أمرٌ لا نكوص عنه، أما العودة إلى الوضعية السابقة في حال الهزيمة، فأمر غير مٌرجح على الدوام. وإن ممارسة العنف، مثل كل فعلٍ آخر، من شأنها أن تُغيّر العالم، لكن التبدل الأكثر رجحاناً سيكون تبدلاً في اتجاه عالم أكثر عنفاً. "ثم تقول السيدة (حنّة) على مشارف الختام : " وينبغي علينا أن نعرف ، أن كل انحطاطٍ يُصيب السلطة، إنما هو دعوةٌ مفتوحةٌ للعنف. "كثيراً ما كان يُوصي أحدنا اﻵخر في المصاعد أو في الطريق إلى لقاء بعض المعارف واﻷقرباء بلائحةٍ تضم مالا يُناقش ومالا يُقال...مع اﻷيام دفعنا هذا الافتعال ﻷن نمحو عن قصدٍ العديد من الدوائر ..بل و نُسقط من الدائرة الباقية بالسهو العمد فرد من هنا وآخر من هناك....أذكر الآن مرةً ضحكنا فيها سوياً حتى الدمع إزاء مشهدٍ تخيليّ كنا نرد فيه على بعضهم قائلين: "لا عادي يا عمو حضرتك مُنتفع وابن كلب ورأيك متسق جداً مع ده" .." مفيش مشكلة يا طنط الله يلعنك ويلعن اللي خلفوكي"..أذكر كيف أني كنت كلما أفرطت في حدّة البذاءة حينها، ابتهجت كصبيّ حرقوا مدرسته !!... بلا سبب أفكر في هذا الأمر الآن فأشعر بالبؤس !... امرأةً محظوظة مثلي لم تختبر من عنف الحياة سوى سطوة هذا اللجام الأخلاقي الذي يفرضه عليها العالم .. فكيف لم تقاوم ولو مرةً بنسفه؟! تضبط حنه دلالات كل من العنف والسلطة، وتحدد أوجه العنف المختلفة سواء في الأنظمة السياسية او الثورات، وتندد بدعوات العنف وترى ان فيها نوع من اعادة لتوكيد التمايز الطبقي.وتنتقد الأحزاب اليسارية وترى انها ابتعدت عن فلسفة ماركس بتبنيها أسباب عاطفية كالاخلاق في ثوراتها وهو ماسعى ماركس لتحرير الثورات منها لأسباب مادية وترى ان التقدم والتطور في الماركسية نتاج حتمي لتطور التناقضات للوصول الى طبيعتها التركيبية ، وتأخذ على الماركسيه اهمالها للتأصيل النظري لمجالس الثورات مقابل حضورها العملي كأسلوب للمشاركة الشعبية (بغض النظر عن جدواها) دفع الى تكوين احزاب يسارية لمواجهة الديمقراطية او بيروقراطية الحزب الواحد فحسب.وتأخذ حنه على الليبرالية عبثية التقدم فيها اذ تنطوي على إيمان مطلق لا عقلاني بالتقدم افرز حركات تقع تحت وطأة التلاعب ورفض النظريات استنادا للواقع (لا يحتاج لقناعة ولربما لمراجعات فكرية) رفضا هشا يحتاج لوقت طويل.كما ترى ان البيروقراطية هي اهم أدوات العنف التي تساند الديكتاتوري بالإضافة الى ان العنف في الديمقراطية والثورات والديكتاتورية يشترك في وجود عنف من قبل الأكثرية تجاه الأقلية، او من فرد او أقلية تجاه الاكثرية او الجميع وهذا الأخير تفرزه الأكثرية الصامته ومن اشكاله الخضوع للمطالب غير الواقعية للأقلية.كما ترى ان فرض القانون والنظام لربما ينطوي على تدهور الرأي العام ودفع الثمن على شكل تأييد قيام دولة بوليسية تستخدم الاٍرهاب لفرض النظام وفي المقابل فإن الاعتراف بالخطيئة الجماعية تجاه جماعة ما هو الا اسهل طريقة للحيلولة دون اكتشاف المذنبين الحقيقين .ثم تنتقد نظريات السلوك والتي ترى ان العنف لايحتاج الى استثارة بل انه امر أساسي للحفاظ على الذات وبغيابه تبرز اللاعقلانية (اي ان العنف من طبيعة الانسان وهذا ما انتقدته حنه بعكس مايظن البعض) بل ترى ان غياب العنف في مواقف تتطلبه لا يعني بروز اللاعقلانية بل عجز المرء ان يستثار، وتنتقد العنصرية باعتبارها حقيقة بيولوجية وترى انها ليست اعمال حقيقة او فكرية قائمة عن أساس نظري علمية بل افعال قائمة على منطقية عنصرية.كما ترفض إسقاط الحياة العضوية على الحياة السياسية باعتبار ان ذلك يبرر للعنف على خلفية الخلق نفسه ليصبح الدمار والعنف متلازمان لسيرورة الحياة. ثم تناقش حنه الفرق بين مطالب الثوار في الشرق والغرب، ومدى فعالية العنف في تحقيق الأهداف قريبة و بعيدة المدى ( ترى ان العنف يعجز عن تحقيق الأهداف بعيدة المدى اي التغيرات البنيوية)وتحاول حنه خلال الكتاب الى الربط بين حضور العنف وحكم الاٍرهاب وغياب السلطة والظروف المرافقة للعنف سواء اكانت على مستوى الأحزاب او الخدمات او الحقوق . Now, this was disappointing!Part I is clearly dated, I was ,nevertheless, surprised from Arendt's trivialization of black student movement, and generally from here "lumping" of the Neo-Leftists student movements across both sides of the Atlantic. Part II, Arendt introduces here definition of Power, Strength, Force, Authority and Violence. Her definition of Power seemed simplistic to me (Where's Gramsci in all of this I kept asking). In this part she introduces the basic premise of the book and that is Power and Violence are opposites, Violence appears when Power is in jeopardy but left to its own course it will ultimately lead to Power's disappearance. The notion of bureaucracy (the rule of an intricate system of bureaus: The rule of Nobody) is the most tyrannical form of rule, there is no one to ask, no one to address, there isn't a single enemy. It renders everyone powerless and with the loss of Power, Violence becomes inevitable. This is a good premises which she could have built on, but she doesn't develop it any further. Foucault's ideas of Power and violence on the other hand are much more developed. In Foucault's earlier works (in Discipline and Punish for example) Power is inherent in such systems and perpetuates itself endlessly through the technologies of control and discipline. Which leaves us with the idea of powerless individuals, however what Foucault develops in his later works is the idea that Power is not a stand-alone essence that exists in individuals, its not an ability (Arendt) rather it is ACTION, it is not the opposite of violence, for the opposite of violence is passivity...anyway, this is not a discussion of Foucault. I understand that Arendt's purpose was not tackle violence as an implement, but as a concept. But, I am still left with many questions. While examining why the student movements of the '60s reached a boiling point, something I didn't expect when I first opened the cover, Arendt disentangles Mao Zedong's axiom that power grows from the barrel of a gun. By clearly and concisely distinguishing terms like power, violence, and authority, words we tend to use synonymously in political discourse, the true source of power is revealed--political action conducted in concert with others--which she then extends to explain the collective feeling of powerlessness that continues to persist in modern democratic societies. Her theory in this piece raises important questions that are even more relevant today than they were in her time, questions that were never resolved by the protests of the '60s, leaving us with a haunting sense that the current trajectory of the modern State, absorbing more and more power into a faceless central bureaucracy that will never hear nor alleviate our grievances, is reaching another watershed moment, another crisis, that is bound to push the disempowered toward the last recourse of political action--violence. كتيب يقع في ١٠٠ صفحة يتكلم عن ظاهرة العنف وظهورها مع السلطة وتوضح فيه أردنت أن العنف يطغى عندما تكون السلطة غير شريعة وما هو إلا أداة وأنه ليس على كل حال خيار غير عقلاني، كما أن خيار اللاعنف الذي إختاره غاندي يصنف أنه عقلاني، كما ترى حنة أن الوسائل في العصر الحديث بسبب تطورها الرهيب لا يمكنها أن تبرر الغاية لإستخدامها، يجدر الإشارة إلى أن الكتاب صدر بعد قيام الحركات الطلابية في أنحاء العالم تحدثت الكاتبة عن طبيعة هذه الحركات ومقاومة السلطات لها وخيار العنف واللاعنف، الكتاب غثيث نوعاً لأنه يتطلب منك تركز بكل سطر. كتاب قيّم، ومع أنه كتب خلال النصف الثاني من القرن الماضي، فإنه يفسر سمات عديدة في عصرنا الحالي، بالإضافة إلى أن الكاتبة عملت في صفحات قليلة على عرض جوهر فكرتها، مع مقارنة ونقاش وافيين لعدة مفكرين اجتماعيين وفلاسفة وآرائهم. Arendt’s book begins by commenting on the paradoxical nature of violence during the Cold War. She says, “The technical development of the implements of violence has now reached the point where no political goal could conceivably correspond to their destructive potential or justify their actual use in armed conflict.” She is, of course, referring to the advent of the atomic age. In an age, then, when the victory of one party of another means the virtual annihilation of both, what political and ideological redress does one have? The first part of “On Violence” argues that the United States is no longer a country which can feel the sharp throes of political populism; she argues that individual action has been deadened by an institutionalized bureaucracy, aided by brain trusters in the illustrious think tanks whose hypotheses eventually turn into “facts,” which in turn beget other “facts,” and whose magical thinking has a way of hypnotizing us. The most common countervailing force to this phenomenon was the group of student protests in the 1960s whose use of violent resistance was often Marxian or Leninist in orientation. These were often set off in the name of “participatory democracy.” Yet what makes this a bit of bittersweet irony is that neither Marx nor Lenin advocated any such like a participatory democracy. Especially in Leninism, the socialist utopia would have been run by a one-party, top-down system which would have rendered both political participation and democracy superfluous. In the second part, Arendt adduces some very interesting, if semantically peculiar, distinctions that I would agree are fundamental to understanding the politics of the twentieth century. She differentiates between “power,” “force,” “strength,” “authority,” and “violence,” which she says are often – mistakably – used interchangeably. Here is a short apercu of some of her definitions. Power applies uniquely to the ability to act not alone, but in concert with others; it can only be maintained by a group, and as soon as the group dissolves (physically or ideologically), so does the power. Strength is what the individual has, and applies only to a single person. Authority is most frequently abused, and “can be vested in persons – there is such a thing as personal authority, as, for instance, between teacher and pupil – or it can be vested in offices, as, for instance, in the Roman senate, or in the hierarchical offices of the Church (a priest can grant valid absolution even though he is drunk. )” Finally, violence is characterized by its instrumental character, i.e., that we use an object to commit violence other than the physical force of the individual or the group. Most interestingly, Arendt intimates that while using radical tactics and espousing antiestablishment means, the student protesters of the 1960s had bourgeois, Enlightenment, technocratic ideas of “progress” and “betterment” in mind. That the means and the ends of these protests were out of synch, for Arendt, posts one of the most interesting questions of twentieth-century American protest politics. Sobre la violencia un ensayo sumamente corto pero con un contenido bastante denso. Es uno de los últimos escritos realizados por la fenomenal Hanna Arendt. El ensayo está dividido en tres partes, comenzando la primera parte con una exposición del mundo en plena Guerra Fría y el terror de toda una generación a la destrucción consecuencia de una catástrofe nuclear. En este marco, Arendt explora el imparable avance de la tecnología bélica, las interrogantes relativas a la utilidad de la guerra en el plano sociopolítico moderno y la cuestión de la paz como fin último de la guerra.Particularmente, pienso que la sección capital de este libro reside en su segunda parte, toda vez que en esta Arendt define violencia y la contrasta con otros conceptos de la ciencia política como el de poder y autoridad. En esta parte del ensayo, la autora expone la tesis principal del libro: La violencia y el poder no necesariamente van juntos de las manos. En ocasiones, donde uno domina absolutamente falta el otro. De ahí que la violencia no es una manifestación del ejercicio del poder, sino más bien que tiene una naturaleza totalmente instrumental. En tanto que en la parte final de este ensayo, Arendt critica la glorificación de la violencia como fuente creadora e intenta abordar el aspecto psicológico de la violencia, donde contradice la idea de violencia como irracional y a la vez refuta las teorías justificadoras de la violencia biológica.Este ensayo tiene como particularidad, el hecho de que Arendt basa su análisis en hechos muy puntuales del momento en que escribía, a esto no me refiero a la guerra fría que había de trasfondo sino a las guerrillas y –sobre todo- las revueltas estudiantiles en las universidades del mundo occidental civilizado. Lo cual hacía la lectura aún más pesada puesto que se trataron de acontecimientos que hoy día ya no tienen tanta relevancia. Sin embargo, debo señalar que el análisis que realiza Arendt sobre las revueltas estudiantiles puede servir para comprender las diversas protestas que se realizan alrededor del mundo occidental como consecuencia de la crisis económica que atraviesan las grandes economías. Especialmente en el contenido no violento de muchas de las protestas. Para concluir, tengo a bien recomendar este ensayo a todos aquellos que deseen conocer otra perspectiva de la noción de poder y la relación existente entre éste y la violencia porque así se apartarían un poco de las tradicionales nociones de violencia y poder, donde la una y la otra son indivisibles y muchas veces idénticas. [Violence] phenomenologically… is close to strength, since the implements of violence, like all other tools, are designed and used for the purpose of multiplying natural strength until, in the last stage of their development, they can substitute for it.pt 3 kinda fucked on race.pg. 81The crucial feature in the student rebellions around the world is that they are directed everywhere against the ruling bureaucracy. This explains what at first glance seems so disturbing – that the rebellions in the East demand precisely those freedoms of speech and thought that the young rebels in the West say they despise as irrelevant. On the level of ideologies, the whole thing is confusing; it is much less so if we start from the obvious fact that the huge party machines have succeeded everywhere in overruling the voice of the citizens, even in countries where freedom of speech and association is still intact. The dissenters and resisters in the East demand free speech and thought as the preliminary conditions for political action; the rebels in the West live under conditions where these preliminaries no longer open the channels for action, for the meaningful exercise of freedom.pg. 72The enormous growth of productivity in the modern world was by no means due to an increase in the workers’ productivity, but exclusively the development of technology, and this depended neither on the working class nor on the bourgeosie, but on the scientists. The “intellectuals,” much despised by Sorel and Pareto, suddenly ceased to be a marginal social group and emerged as a new elite, whose work, having changed the conditions of human life almost beyond recognition in a few decades, has remained essential for the functioning of society.…For better or worse – and I think there is every reason to be fearful as well as hopeful – the really new and potentially revolutionary class in society will consist of intellectuals, and their potential power, as yet unrealized, is very great, perhaps too great for the good of mankind. Arendt's long essay/short book "On Violence" notes that war has become unglamorous and ineffective as a political force, yet it remains because we have not found an adequate replacement for this. This is perhaps understood as a more politically-minded equivalent of William James's idea 60 years earlier that we need to find a "moral equivalent of war" that will harness the cooperation and personal altruism that war can elicit, but without the horrific consequences that far outweigh the benefits.Among the many useful concepts in Arendt's book are the definitions of power, violence, strength, force, and authority as distinct entities, despite our tendency to conflate them, or use them as synonyms. Most important is the difference between power and violence, which Arendt suggests are often found together but are in fact opposite in many ways. Specifically, while violence can undo power, it cannot build it. Violence is not simply power expressed in its most brutish fashion. Also important is the final third of the book, in which Arendt takes apart the notion that political violence is somehow "natural" or part of the human condition. In the end, it is this idea that is at the center of the book: violence is routinely accepted as inevitable--as a given in human society. Arendt asks us to acknowledge the much more troubling truth: violence is conscious human action. It should not be natrualized or taken for granted or romanticized, but carefully examined.The book is well-written, yet dense and often casually drops historical and philosophical references without much explanation for the uninitiated reader. Despite that, it is readable despite its often abstract nature. It doesn't leave you with a clear call to specific action, but by openly questioning longstanding myths about violence and its alleged utility in solving political problems, it does a great service. هذا البحث هو عبارة عن دعوة من حنة أرنت للانشغال بدراسة العنف كظاهرة مستقلة بذاتها، في مخالفة للسائد وقتها من اعتباره ظاهرة طبيعية أو هامشية داخل سيرورة المجتمعات البشرية. إن ما تحاول أرندت فعله هو فصل ظاهرة العنف عن السلطة. إن السلطة موجودة في جوهر كل حكومة؛ السلطة لا تحتاج فعلا إلى تبرير أو هدف، فبرغم أن الحكومات تستخدم سلطتها لتحقيق غايات ترمي إليها مسبقا، لكنّ بنيتها سرعان ما تسبق وتتجاوز هذه الغايات، فتصير السلطة شرط وغاية ذاتها، ولا يعود لسؤال: <<ما هي غاية الحكومة؟>> أي معنى، حيث أن محاولة الإجابة عليه لا بد أن تحيل إلى مثال طوباوي. إن ما تحتاج إليه السلطة فعلا هو المشروعية، التي تستند إلى الماضي، وتتطلع نحو القاء الأول، أكثر مما تهتم بأي هدف مستقبلي.بينما لا يكون معنى للعنف، بسبب طبيعته الأداتية، بدون وجود هدف أو غاية. إن معناه ينبثق من إمكانيته المستقبلية. وبالتالي فالعنف إجرائي دائما، ولا يمكن أن تُخلع عليه المشروعية، وإن أي تبرير له لا بد أن يرتبط بغايته حصرا.والعنف والسلطة ليسا ظاهرتين منفصلتين فقط حسب أرنت، بل هما ظاهرتان متضادتان، فإن وجود أحدهما هو التجلي الأوضح لغياب الآخر، إن انزلاق السلطة نحو العنف هو إعلان لانحسارها وتهديد وجودها. والعنف قد يكون ممكنا كأداة للإصلاح السياسي، لكنه لا يكون أبدا أداة لخلق السلطة. يكاد أن يكون أمرا غريبا رفض هانا آرندت لأي شكل من أشكال العنف و رفض أي تبرير له،و هي التي عاشت تجربة مريرة في معسكرات الاعتقال النازية و شاهدت بأم عينها قدر العنف النازي و عدم القدرة على الرد عليه بعنف مضاد.تتحدث آرندت عن العنف كنقيض للسلطة التي ان استخدمت العنف تحولت الى دكتاتورية فاقدة الى اي صفة شرعية،و لكنها بالمقابل تجتزء الكثير من العبارات المحرضة على العنف من سياقاتها لتثبت قبح أي عنف و ان كان موجها ضد محتل أومستعمر او مضطهد مثلما كانت تركز في هذا الكتاب على أقوال فانون و سارتر و سورويل و غيرهم دون عرضها في اطارها الشمولي الذي يحرض على العنف في خضم الثورة او المقاومة،فنراها تعد ان هذا هو الاطار الفكري العام لهؤلاء الذين تعتبرهم دعاة للعنف دون ان تركز على قوى العنف العظمى التي تراها تمتدح بعضها ضمنيا من مثل الولايات المتحدة التي تحمل فيها السود مثلا مسؤولية خطاب العنف في اشارة الى مالكوم اكس و بعض زعماء حركة الحقوق المدنية.بالامكان التعويل على الطرح الفلسفي الرافض للعنف من قبل هانا آرندت رغم ان التركيز لم يكن كبيرا عليه من قبلها بقدر ما كان على علاقته بالسلطة و الثورة. Written in 1969, this is Arendt's brief appraisal of the 1968 student upheavals, and the civil disorder occurring across American cities at the same time. Some of it repeats ideas from "On Revolution" a decade earlier, but there is new commentary from her engagement (mostly sceptical) with the student literature. She didn't think much of Fanon, though acknowledged that he wasn't deeply studied by his self-declared disciples. Black Power movements also get a harsh assessment, though she recognises the existence and influence of racism as an ideology. Most perceptively, she does predict that "law and order" will become the code-word for racial issues in post-60s right-wing politics. مرة أخرى أقول أننا لا نعرف إلى أين سيقود هذا التطور كله، لكننا نعرف، او ينبغي علينا أن نعرف، أن كل أنحطاط يصيب السلطة، أنما هو دعوة مفتوحة للعنف - ولو لمجرد أن اولئك الذين يقبضون على السلطة سواء أكانوا حاكمين أو محكومين، إذ يشعرون بأن هذه السلطة تفلت من بين أيديهم، يلاقون على الدولة أكبر قدر من الصعوبة دون مقاومة إغراء أستبدال السلطة بالعنف. Hannah Arendt - Hannah Arendt (1906–1975) was one of the most influential political philosophers of the twentieth century. Born into a German-Jewish family, she was forced to leave Germany in 1933 and lived in Paris for the next eight years, working for a number of Jewish refugee organisations. In 1941 she immigrated to the United States and soon became part of a lively intellectual circle in New York. She held a number of academic positions at various American universities until her death in 1975. She is best known for two works that had a major impact both within and outside the academic community. The first, The Origins of Totalitarianism, published in 1951, was a study of the Nazi and Stalinist regimes that generated a wide-ranging debate on the nature and historical antecedents of the totalitarian phenomenon. The second, The Human Condition, published in 1958, was an original philosophical study that investigated the fundamental categories of the vita activa (labor, work, action). In addition to these two important works, Arendt published a number of influential essays on topics such as the nature of revolution, freedom, authority, tradition and the modern age. At the time of her death in 1975, she had completed the first two volumes of her last major philosophical work, The Life of the Mind, which examined the three fundamental faculties of the vita contemplativa (thinking, willing, judging).